DW-84 This larger kitchen scale features a satin finish stainless steel exterior. No matter which one you choose, the DW-84 will look great sitting on your countertop as it assists you in measuring whatever you may need measuring. This scale can handle volumes all the way up to 2.1 liters. Measurements can be made in graduating amounts of just 0.1 ounces (1g). 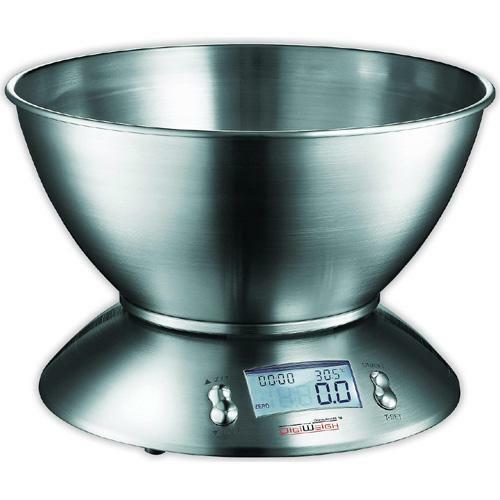 Featuring the ability to measure individual ingredients using the tare feature, making cakes or breads would be one bowl simple with this handy and attractive scale. It also has a room temperature reading and displays the current time as well as features a built in timer. A low battery indicator and overload warning are also included. LCD Size 1.9" x 0.9"